This week, we have spent some time exploring options to provide a web client for Microsoft Lync 2010. As we started to explore this area, we anticipated that we would simply use a Lync web client SDK from Microsoft. However, with Lync 2010, there is no default web client or web client SDK. Initially, we thought that we might be able to extend, and possibly use, the Lync web client that is provisioned as part of a Microsoft Office 365 configuration. Apparently, this web client can also be configured as an extension to an Exchange 2010 installation with the addition of the OWA and OCS 2007 R2 web client installation. After some low level investigation with Fiddler we decided that a more structured, and open, approach would be better option. While the integration provided with the Exchange 2010 OWA looked promising, it was a bit too heavy for what we wanted. So, we continued our investigation and located a few promising projects on Codeplex. This project provided a nice base platform for developing a customized web client for Lync 2010. After a bit of work, and some modifications on our side, we had a nice looking web client for Lync 2010. In terms of our modifications, we externalized some of the configuration - to allow for manually configuring the Lync server details. 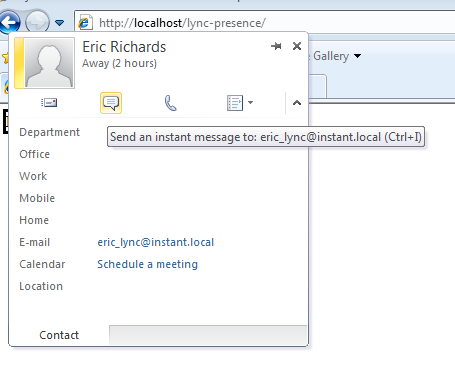 We also migrated the Lync end point from using application end point to an end point that acts as a simulated SIP user. We typically experience a high level of success (mostly with presence based API calls) when we use a end user end point - as opposed to the application end point. Our next steps will focus on some additional wiring to pass the end user's credentials to the the client (using Windows pass thru authentication) as well as some other configuration options. Internet Explorer must be used when navigating the site. It's the only way to interface with the necessary DLLs to call the local Lync client. Office 2007 or 2010 must be installed. This places down the proper Lync presence/integration DLLs for us to use through the web. Lync client must be installed (running too if you expect to get the Lync client and not the web client). Our code here builds an object called nameCtl out of the name.dll NameCtrl control that is enabled with Lync and Office 2007+. This object opens up some other properties and functions that we can use to show information about the user, and track status. Our 'onStatusChange' function tracks a user's presence, it polls for the users current settings, and alerts it. The 'showOOUI' function will show an interactive display when called (more on that in a bit) and the hideOOUI function removes it. Let's build a page now that we can use to test our library. Have you shared or posted you code you developed? Hi, Do you have the source code for this article posted anywhere?